Worship Service – 9:30 a.m. & 11 a.m.
At First Baptist Church, our first worship service offers a contemporary flow with its music and liturgy while our second service follows a traditional Baptist service. Each service enjoys our talented vocalists in the adult choir and Praise Team as well as our gifted organists, pianists, guitar players, and drummers that lead music each Sunday. Children and youth participate frequently in our worship, often taking leadership roles singing, playing chimes or handbells, reading Scriptures, and acting. We welcome children in worship, but we also realize that some children might not be quite ready to sit through an hour-long service. We offer Worship Care for our little ones ages 5 and below. 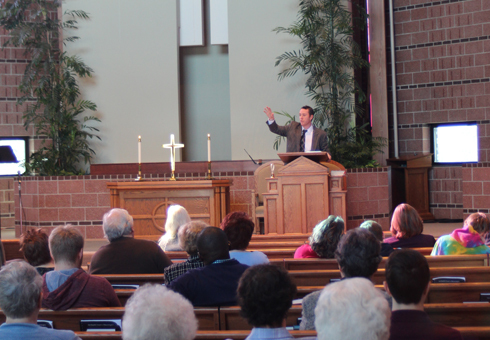 Finally, our pastor’s sermons are thoughtful, engaging, practical, and challenging. Biblical stories and Scriptures are explained in ways that are easy to follow, whether you grew up in the church, or whether you’re a first time visitor. While personal stories –often humorous – are frequently woven in, the goal of our sermons is not to entertain us, but to equip us, to teach us, and to inspire us to action – encountering the one true God and engaging in a forever relationship with His Son, the Lord Jesus Christ! Church School – 9:30 to 10:30 a.m.
We have Church School for all ages. We believe that these classes provide a wonderful opportunity, in a small group setting, to prepare the young (and the not-as-young!) in the service of Christ. 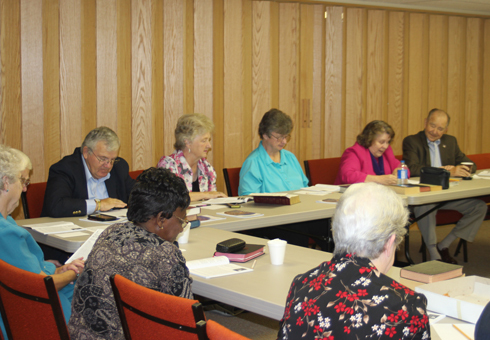 Small groups study Bible stories or Christian-based books and consider ways to apply the lessons learned to our own lives. There is no Church School for all ages in August 2016. Church School will resume on the second Sunday in September. In past years in August, adults have combined to study books such as Toxic Charity: How Churches and Charities Hurt Those They Help (And How to Reverse It) and The Art of Neighboring: Building Genuine Relationships Right Outside Your Door. Note: Church School for grades 9 through 12 will attend the first worship service at 9:30 a.m. and continue to Church School class after the Gathering Time in Barker Hall. We understand our students at this age have a difficult time rolling out of bed so early in the morning so we hope this adjustment will give them the opportunity to still attend Church School. The Gathering Time (or Fellowship Time) – 10:30 to 11:00 a.m.
Come join us for some light refreshments in a relaxed, informal environment. This is a great opportunity to continue Church School or first service discussions, to strike up a new conversation with someone you have not met before, or to reconnect with a friend – while enjoying some coffee! We invite you to fellowship with us during this time in Barker Hall (the large hall, adjacent to the sanctuary)! By the way, our church office is open from 9:00 a.m. to 1:00 p.m. Monday through Thursday if you would like to meet with one of our pastors for additional information.